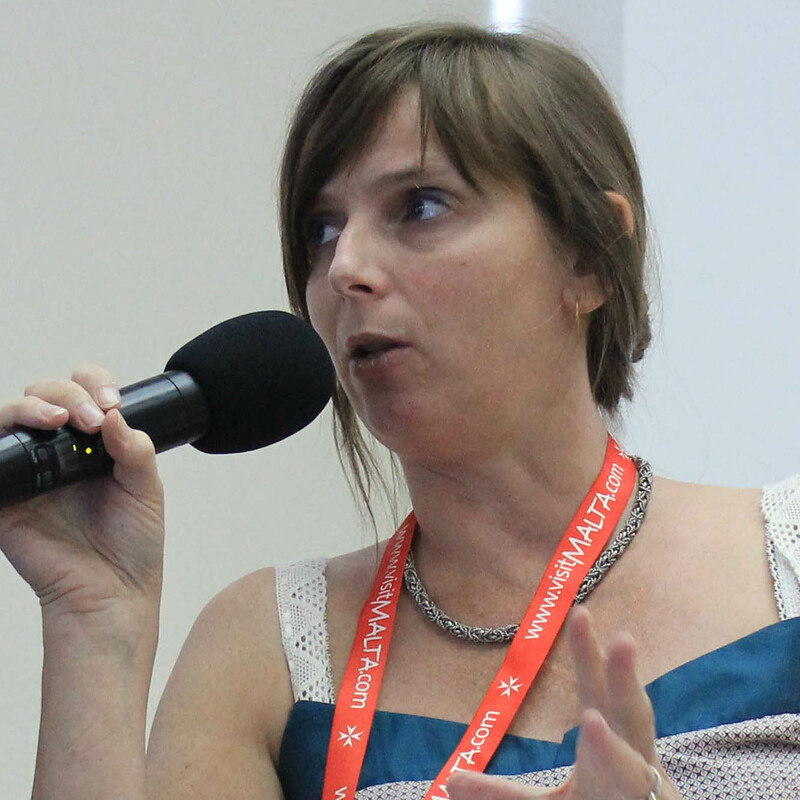 « How to reach 400 Facebook fans in 10 days (without buying them)? 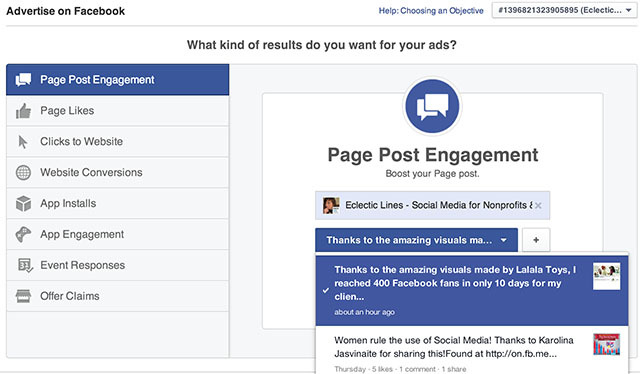 Facebook Page Posts ‘organically’ only reach about 16% of your fans . This means that without advertising, the majority of your fans will not even get to see your posts on their News Feed. 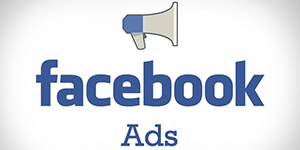 If you want to have an audience, it’s extremely important to start using Facebook Ads. 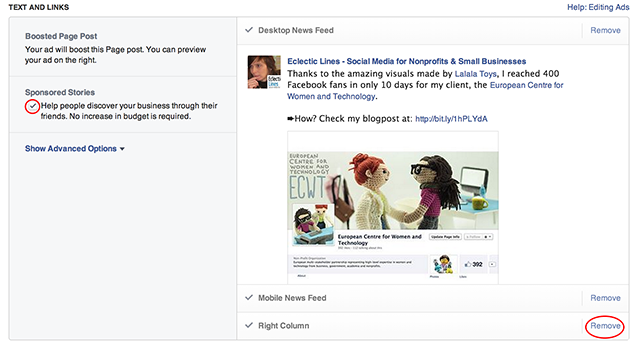 In this post I will explain how to set up your first Facebook Ad through the Ads Manager. If it is the first time you create an Ad with your account, an Ads account will be created and associated to your profile, as soon as you start creating your first Ad. Simply go to the settings wheel and select “Advertise”. You will then be prompted to the page where you can start creating your first Ad. 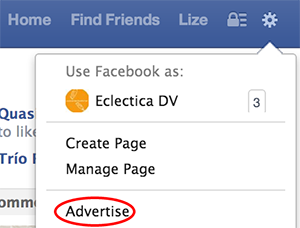 Any Ad on Facebook can be placed either in the News Feed (on desktop or mobile) or in the Right Column next to the News Feed (desktop only). If you promote a post, Right Column placement does not make any sense, so choose to “remove” that placement. The next step is to establish your audience. Carefully select the location, demographics and – very important – the interests of the people you want to target. If you want to find your way in the complex world of Facebook Advertising, you need to understand the difference between a “Campaign” and an “Ad”. Basically, the difference exists in the fact that “Campaigns” contain different “Ads” that all share 1 overall campaign budget. It is impossible to create an Ad without assigning it to a Campaign. Even if you’re creating only 1 Ad, you will have to create a Campaign for that Ad. 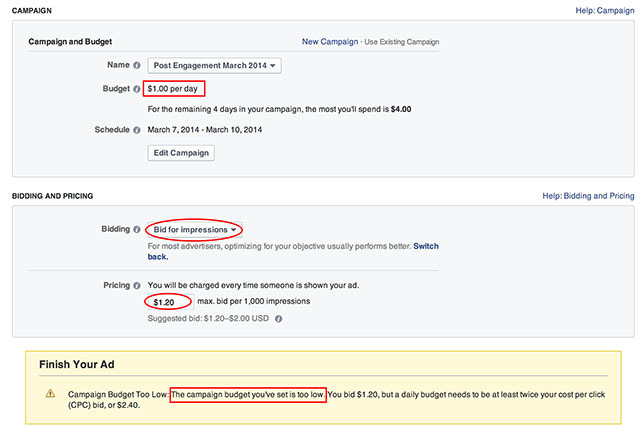 When you create a Campaign, Facebook will ask you to create a name, a budget (of minimum 1$ per day!) and a period for running the Ads that will be added to your campaign. As for the price of your Ad, you have the choice to “bid” (i.e. 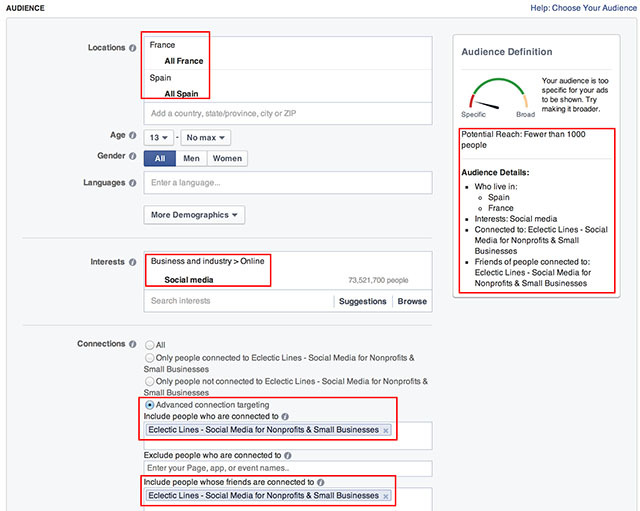 to compete with other advertisers) for “impressions”, “clicks” or “actions” (i.e. the way you will be charged). In this Ad, I proposed to be charged the suggested $1.20 for each time my post will been shown 1.000 times (i.e. 1.000 impressions). But it didn’t work, as the rule says the daily campaign budget must be at least twice the bid price. To solve this, I did NOT follow Facebook’s suggestion to increase the campaign budget. Instead, I decreased the bid price to $0.50, because I wanted to keep my daily campaign budget to a maximum of 1$ per day. As soon as you push the “Create” button you will be sent over to the default view of the Ads Manager that gives an overview of all your Campaigns: their name, status, results, cost, reach, start & end date, the budget you’ve set and how much of that budget has been spent. If you select the left column column tab “All Ads”, you will see a detailed overview of all your Ads: the campaign they’re assigned to, their status, objective, results, bid price and how much you’ve spent on each Ad. Ads are not created automatically but have to pass Facebook’s approval process, which generally doesn’t last more than 1 hour. As soon you receive an email notifcation that your Ad is approved you will see that the status of your Ad changed into “active”. In this case, my Ad wasn’t approved because it uses too much text in the image, which violates Facebook’s Ad guidelines. 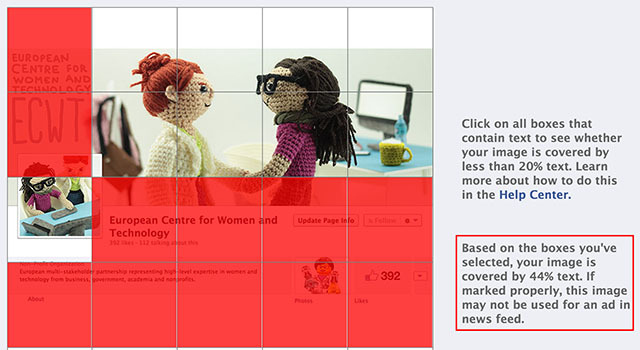 Ads that show up in the News Feed are not allowed to include more than 20% text.